1. Coconut Chips by Hippie Foods. Where to buy: Nourish Market, Whole Foods, etc. 2. Vegan Coconut Kaffir Lime Ice Cream by Earnest Ice Cream. 3. Avocado Lime Pie by The Pie Hole. 4. Mango, Truffle, and Pineapple Wasabi Macarons by Soirette. Where to buy: 1433 W. Pender St.
5. Lemon Loaf by To Die For Fine Foods (by yours truly). 6. Alive and Radiant Chocolate Kale. 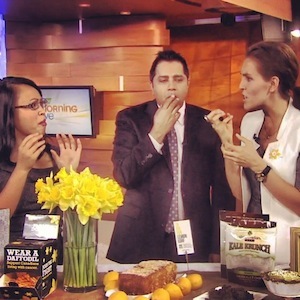 Learn more about the Canadian Cancer Society’s ‘Desserts & Daffodils’ campaign here.